McCart Plumbing Inc. | Copper is no sweat to us. Once you become a McCart Plumbing customer, you’ll appreciate the quality and professionalism of our work. All of our technicians are professional, and our trucks are clean and professionally stocked. Hot water is an important part of your home. If you are experiencing Water Heater issues, contact the experts at McCart Plumbing. We thoroughly inspect and repair the Water Heater, and when the time comes, we can sell and install new models. No matter what size of Water Heater you want for your home or business, we can find the right match for you and promptly install it. We offer top quality Water Heaters that include a 6 year manufacture warranty. If Drain-O isn’t doing the trick anymore, it might be time to have your drains and sewer pipes cleared and cleaned by a professional. We can get those pipes and drains flowing freely like they should. We can take care of all of your drain and sewer pipe issues. Behind your walls and beneath your floors there is an intricate network of water supply lines, drain and vents that make up your plumbing system. Sometimes your business or home’s drains clog or your pipes leak, freeze or burst requiring repair or maintenance. Your water supply pipes may have problems or limited water pressure, impacting everything from the quality of your shower and the flush of your toilet to the reach of your lawn sprinkler. Call out experts to diagnose, repair any plumbing needs. Your plumbing may be part of a much larger project, which is why you want to choose a plumbing company with experience in new construction and remodeling. You need contractors who will not hold up the rest of the building project. You can be sure that your plumbing work will be on time and on budget. 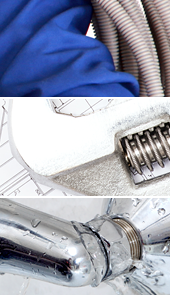 We handle everything from pre-construction plumbing work to final trim out. If there’s a plumbing problem in your home, we’ll fix it. There’s a long list of things that can go wrong in any home—leaky toilets, leaky faucets, hot water heaters that don’t work, clogged pipes, septic problems, low water pressure. We’ve seen just about everything and know how to fix it all.